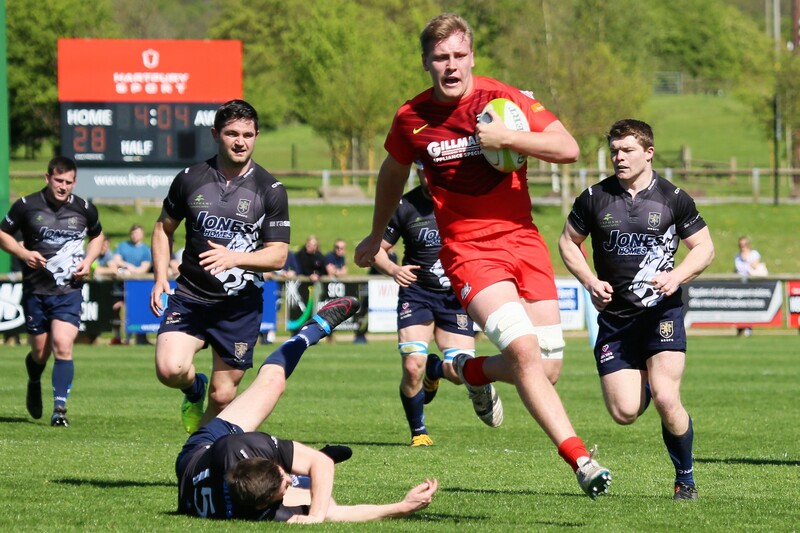 It was fun in the sun as Hartpury brought the curtain down on their 2016-17 home fixtures with this resounding win over relegated Macclesfield. Fourteen tries, including a late 9-minute hat-trick for league-leading scorer Jonas Mikalcius, tells the tale of a game in which the visitors were competitive in the opening exchanges before being blown away by Hartpury power and pace. With Gloucester on A-League duty this week, there was minimal representation from the Premiership club meaning some new faces in the home line-up. Maliq Holden, a scorer at Twickenham in the recent BUCS final, made his league debut at full-back, whilst Charlie Chapman at scrum half was stepping up from under-18 rugby. Will Chapman be the next ‘nine’ to emerge from a production line that has seen Dan Robson, Callum Braley, Ben Vellacott and Harry Randall all start promising careers in recent seasons? Adam Hastings made his first appearance for a number of weeks and the Glasgow Warriors-bound fly-half produced a classy performance, setting his backs moving well and kicking beautifully from both hand and tee. The pack was relatively settled, with the return of giant prop Josh Ibuanokpe being the only change in the starting eight. The scoring started in the 8th minute when centre Steve Leonard hit a popped pass midfield and carried straight on to the posts. The lead was short-lived, however, as a kick behind the home defence led to a 5-metre scrum and the Blues pack did the rest, opting to scrummage a couple of penalties before referee Chivers took them under the posts. There was no further scoring for ten minutes but Hartpury were starting to build a head of steam and it was no great shock when the break-through came. Holden made some ground wide on the left and his inside ball was well-timed for athletic lock forward Joe Dancer to finish well from 25 metres. Even in the 20th minute, that signaled the end for the visitors as Hartpury started to shift through the gears. When a Macclesfield lineout, deep in their own half, misfired, quick ball into the midfield gave Luke Eves the chance to produce a muscular touchdown close to the posts. 10 minutes later, Mikalcius come off his wing to carve a path through the heart of the Blues defence. His well-timed pass found Harry Cochrane on the right wing and there was a run-in for the speedy Channel Islander. Bonus point 15, from 15 home matches played, was duly achieved. Joe Batley soon made it a scoring double for the second row. He picked a good line through the increasingly stretched visiting rearguard and had the pace to go all the way from long range. On the stroke of half-time, Holden capped a good first 40 minutes of National League rugby with a well-taken try. After making ground down the left wing, he threaded a grubber through the Blues cover and was first to the bouncing ball. Hastings, maintaining a 100% kicking record in the first half, made it 42-7 at the break and the crowd were enjoying both the weather and the entertainment. The second period started with more heavy Hartpury pressure but Macclesfield, having re-grouped at half time, were defending well. They appeared to have survived a series of near squeaks in the 55th minute when a penalty, for holding on, allowed them to clear their lines. Once again, though, their lineout was untidy and flanker Mat Gilbert was able to pounce on the loose ball and drive to the try-line. That score seemed to knock the stuffing out of the Blues and they had to endure a torrid 25 minutes until the close. Hartpury ran the ball straight back from the restart and, when Mikalcius popped the ball inside, Leonard was on hand to score his second of the match. Holden was the next player to grab a double. He was now on the wing and when replacement full-back, Jamie Forrester, came into the line at pace, he was the extra man with a simple finish. The favour was returned shortly after. Holden was able to tap back a well-weighted Hastings cross-field kick and Forrester was on hand to get the touch. Two minutes later, Hastings demonstrated his virtuosity by repeating the trick, this time to the other wing, where Mikalcius gratefully took the ball and went outside the cover without having to check his stride. He was to grab two more before the end, both times finishing strongly after being well worked-in by his team-mates, and there was also time in a crazy last 10 minutes for him to turn provider and allow Luke Eves to get a second for himself. Mikalcius now has 33 tries for the season. He and Eves, who has 19, are the two leading scorers in the division, with Jake Polledri (16) and Steve Leonard (14) also in the Top 10. Hartpury now go to Blackheath in their final game, looking for a history-making win and a 100% season record.